Join our community to download and try various Houdini Digital Assets. Houdini Digital Assets have features (sliders, menus, etc.) for quick and specific adjustments. The level of customization is limitless for the author to decide what can be controlled. Houdini Digital Assets are not restricted to just geometry: you can find effects, tools, shaders, environments and much more. The Orbolt Smart 3D Asset Store is an asset marketplace that offers a whole new way to create animations and visual effects. Powered by Houdini, Orbolt assets are fully customizable and ready to animate and render once tweaked to meet your specifications. At Orbolt, members of the global Houdini community apply their knowledge and expertise to deliver a comprehensive set of completely customizable 3D assets, from fully-rigged props, to render-ready visual effects, animatable characters, game assets and more. Now you can access high-quality 3D assets from a community you can trust to keep your project on-time and on-budget. Digital artists, like yourself, are being asked to create more and more animation and VFX shots, while achieving realistic results with tighter deadlines and shrinking resources. To handle the workload and keep focused on the creative process, it is time to go procedural with Houdini. Houdini offers unprecedented levels of flexibility and control which will enhance the way you work creatively and make you and your team much more productive. Various Houdini Digital Assets have been designed to also work in other applications with the Houdini Engine plugin such as Maya, Unity 3D, Unreal Editor and Cinema 4D. Join the Orbolt community and become a smart 3D asset author. Set your own prices and let Orbolt deliver your assets to the world. Houdini 17.5 introduces PDG which is designed to enhance SideFX’s procedural architecture to distribute tasks and manage dependencies to better scale, automate, and analyze content pipelines for Film, TV, Games, Advertising and VR. In addition, there have been a number of enhancements to key features such as FLIP Fluids, volumes, destruction tools and more. Whether you are a feature film VFX artist, a game developer or a commercial studio, Houdini 17.5 brings you new and enhanced tools to meet your most demanding production requirements. 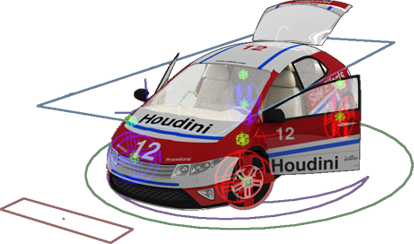 Houdini 17.5 is a important release that includes a number of key features including the introduction of PDG | Procedural Dependency Graph. This new technology is available in the upcoming release of Houdini 17.5 as a new Houdini operating context called TOPs (Task Operators) and as a standalone application called PilotPDG™. SideFX is bringing the Houdini HIVE to GDC on March 20-22 with educational and inspiring presentations by both SideFX technical experts and industry professionals. Join us at the HIVE to discover how game studios use Houdini's procedural software to create content for games, virtual worlds and more.